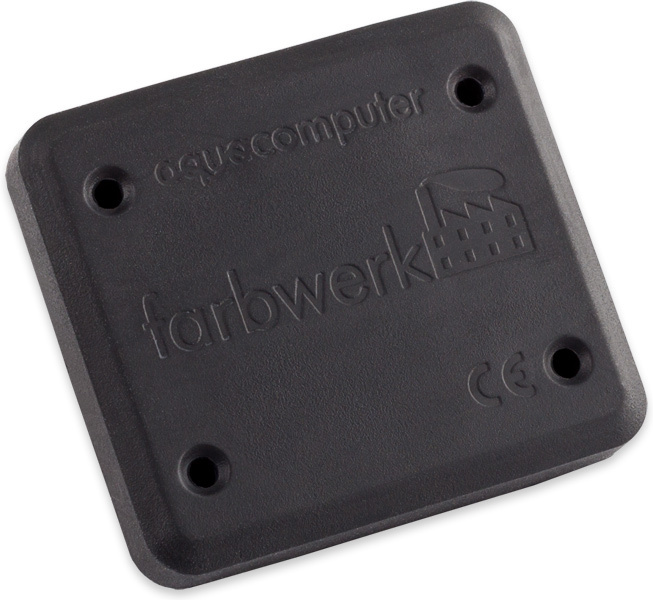 The "farbwerk 360" is a powerful RGB effect controller for up to 360 addressable LEDs, compatible to the Aqua Computer RGBpx product line. 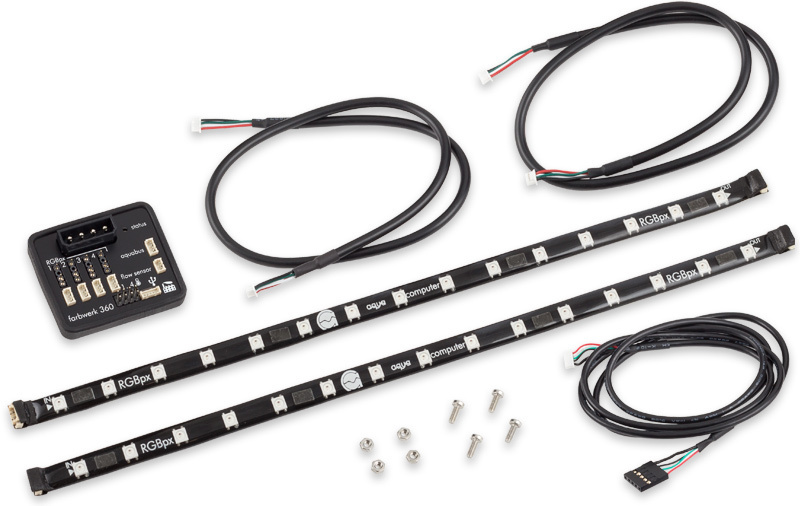 Each of the four RGBpx channels of the farbwerk 360 can control 90 addressable LEDs independently. Color and brightness can be individually controlled for each LED. In total, up to 20 groups of LEDs of varying size can be configured, and visual effects can be assigned to each group. The 23 available effects can be extensively adjusted for further customization. Many effects can also be configured to modify effect parameters (for example speed) depending on current sensor data. 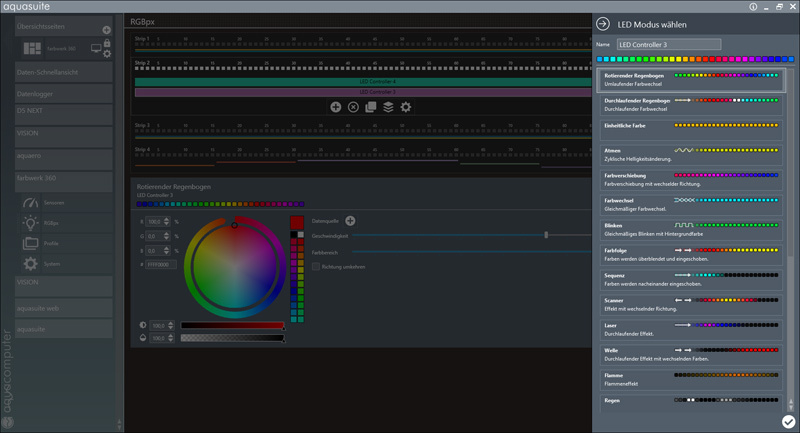 The available effects also include sound-to-light effects, visualizing computer sound output. 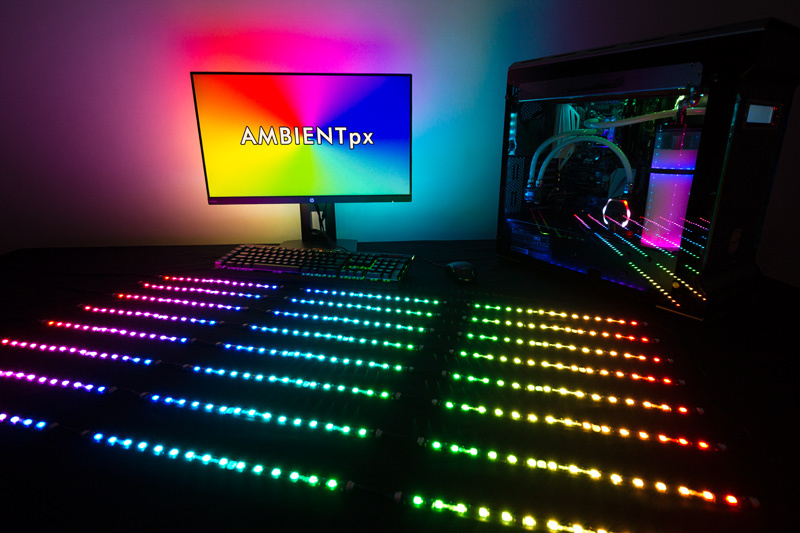 The AMBIENTpx effect deserves special notice, replicating the border area of the current monitor display on connected LEDs, allowing for an impressive background lighting surrounding the monitor. Each of the 20 configured effect controller can be assigned to multiple areas of the connected LEDs up to a total of 60 assignments combined - perfectly suited to illuminate multiple fans identically for example. Additional to defining colors, transparency can be defined in the effect controllers of the farbwerk 360. If multiple transparent effects are defined for a LED or a range of LEDs, the result will be an overlay of the assigned colors. An extensive profile management can be used to switch effectively between different configurations. Four profiles are available, the configured effects (and areas of LEDs respectively) can be freely assigned to each of the profiles. The active profile can be set manually or automatically depending on sensor values or depending on applications currently running on the PC. For example, distinctive lighting settings can easily be configured for office use and gaming, with automatic activation of the gaming setting the moment the game is stated. As sensor values, the four temperature sensor inputs and the flow sensor input as well as sensor data from the Aqua Computer Hardware Monitoring is available, enabling automatic profile selection depending on CPU load or CPU temperature for example. 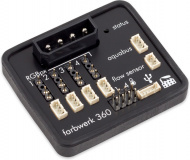 The farbwerk 360 is an autonomous device with an embedded micro processor and can be operated without a PC. The configuration is stored in the device itself, a multitude of functions can be used without connection to a PC. Screen content preventing analysis by DRM or similar methods cannot be utilized for the effect. The aquabus port of the farbwerk 360 is currently without a function. A control or readout via an aquaero 5/6 is not possible. This product contains a non-expiring license for the active version of the aquasuite software at the time of device activation and update service for a period of at least six months. Please note that an internet connection is required for the installation and activation of the software. Further information about the licensing and activation of the aquasuite software can be found here. This product was added to our catalogue on Monday, 01. April 2019.